Eli Roth is a filmmaker who seems to have certain audiences split right down the middle; some praise his fearless approach to gore and extreme violence, while others can’t stand his juvenile sensibilities as shown in his obnoxious humour and even more insufferable characters. However, whether or not you’re a fan of his films, which include the likes of Cabin Fever, Hostel, The Green Inferno, Knock Knock or his Death Wish remake from earlier this year, there is something admirable about the uncompromised passion he brings to each and every one of them, like he’s making something that he himself would have watched religiously when he was a movie-loving kid back in the day. 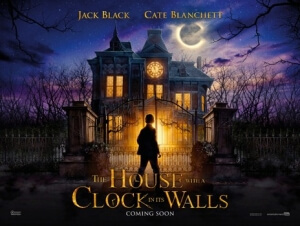 His latest feature, an adaptation of the late John Bellairs’ horror-fantasy book The House with a Clock in its Walls, is significant because it not only marks Roth’s first foray into family features, but it’s also a loving homage to the kind of movies that any child growing up in the 1980s, and not just Roth, would have begged their parents to let them see in the cinema. That’s primarily because back then, in a time before PG-13 and 12A, the most intense kids’ films were rated PG and were allowed to be as messed up as some of the horror movies we get today (lest we forget, Poltergeist was a PG when it first came out, as were both Gremlins and Indiana Jones and the Temple of Doom among others, whereas nowadays those movies would without doubt be assigned a PG-13/12A at minimum), and with this film Roth has done his utmost to bring back that feeling of watching something intense without the necessary parental guidance, so in that regard it’s something quite special. As a movie on its own merits, thankfully it’s not that bad, though I’d hesitate to call it an instantly classic kid-friendly horror movie either, for a couple of Roth-related reasons. Set in 1953, a recently-orphaned young boy named Lewis (Owen Vaccaro) is sent to live with his estranged uncle Jonathan (Jack Black) in the Michigan town of New Zebedee (where I’m guessing it’s always time for bed… yeah, you might want to look up that reference to get it). Lewis soon discovers that Jonathan is a magical warlock, and that his neighbour and friend Florence Zimmerman (Cate Blanchett) is a more powerful but well-intentioned witch, both of whom are struggling to solve the mystery of an ominous ticking clock hidden somewhere within the walls of the house by its former owner, the sorcerer Isaac Izard (Kyle MacLachlan) who intended to use the clock as a means to bring about the end of the world. Fascinated with this world of magic he has stumbled into, and as an attempt to get in the good books of some bullish kids at his new school, Lewis begs to be trained in the ways of the warlock, and soon he must use his newfound magic abilities to help Jonathan and Florence find the clock before it’s too late. For his past couple of movies, Death Wish and now this, Roth has handed writing duties over to other scribes which, in both cases, has resulted in those films being regarded as some of his better films, a fact that really speaks volumes about how ill-received Roth’s writing is amongst critics and audiences. In this case, the script was written by Eric Kripke, best known for creating cult TV shows like Supernatural and Timeless, and fans of those shows will be quick to pick up on the eccentric and sometimes irreverent writing style he also brings to this movie, albeit for a much more family-friendly audience; it has a sense of humour about itself, never taking itself too seriously (almost to a fault, which I’ll explain in a bit) and contains a decent-sized heart to it thanks to the likeable and entertaining characters we are going on this journey with. Black and Blanchett are both having tons of fun in their roles, sharing good chemistry and trading some fun wit between each other that feels like they’re two people who’ve known each other for years and respect each other to make friendly jibes towards each other. Vaccaro, best known for being one of the kids from the Daddy’s Home movies, is a fine young actor who’s given a sympathetic character to play that can be simultaneously smart and also doing stupid things like young kids realistically tend to do, although here there just happens to be magic involved. Roth wears his Amblin influences on his sleeve, from the exquisite production design to the colourful cinematography to, of course, some intense sequences of child-friendly horror that’s just satiable enough for the audience it’s clearly aiming towards. It’s a movie that tends to use CGI quite a lot, and the inner film geek in me would have preferred if Roth went all the way in calling back to 80s-era movies like this by using more practical effects or even Harryhausen-style stop-motion, but the effects here are serviceable enough, though there are uses of it that really do make the film a lot scarier than it was even intending (there’s a CGI shot of Black during the climax that is guaranteed to haunt your nightmares). There are also moments when Roth’s immature nature does tend to take over and ruin the tone of the scene; for example, a whimsical moment between the main characters abruptly ends with a poop joke (and a reoccurring one at that), and immediately cuts to the next scene where that previous tone is re-established like that out-of-nowhere gag never happened. It suffers a bit from tonal whiplash at times, but it didn’t derail my overall admiration for the film; though I don’t think it’ll be a movie that’s remembered by children in this day and age, it’s a decent little throwback to the kinds of films that kids back when Roth was young would have obsessed over. The House with a Clock in its Walls is an admirable throwback by director Eli Roth to the more intense family movies of the 1980s, which though not without its flaws makes for the filmmaker’s strongest film to date.